I'll be presenting at the Spring ACS National Meeting in New Orleans in just over a week. The last ACS I was at was three years ago so I'm looking forward to catching up with what's been going on, and meeting up with some familiar faces. 1. 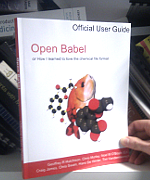 I'll be talking about "What's new and cooking in Open Babel? ", as part of Rajarshi's CINF Flash talks on April 7 (Sunday) sometime between 12.30 and 2.00 in Room 350 (Morial Convention Center). I think Rajarshi is still accepting CINF Flash talks so get them in. 2. "Universal SMILES: Finally, a canonical SMILES string?" This presents the work described in a recent paper. 3. "Roundtripping between small-molecule and biopolymer representations". This describes some of the issues and challenges that have arisen in the development of the Sugar & Splice software, a toolkit for perceiving biopolymer structures, depicting them and converting them between formats. 1. Created using a Google spreadsheet and Timeline JS. 2. If anyone wants to send me updates (e.g. for commercial software like ChemDraw I found it hard to find dates and versions), feel free. I've just become a convert to Fuzz testing. This is a rather simple idea for testing software that processes some user input: just send in some random junk and see what happens (and keep repeating until something does). I tried this for some software I've been working on, thinking it was so dumb it couldn't possibly flush out anything useful, but quickly changed my mind. Even more interesting, where the space of all possible user input can be stepped through systematically, fuzz testing can be used to map out the space of allowed input (which may or may not be what you were expecting). For example, you could find all 4-letter words acceptable to OPSIN by using the code below to generate fuzz and use OPSIN through Cinfony (for example) to find out whether an error is raised. There's something that's always annoyed me when using Avogadro. On Windows, it often takes several clicks on a hydrogen before I hit the sweet spot and it sprouts a methyl group. This is only mildly annoying when building a structure, but very frustrating for operations where misclicking cause it to lose selection (e.g. rotating around a dihedral). It's awkward to report a bug about this though because it's hard to prove. You mightn't understand everything here, but you should get the gist. 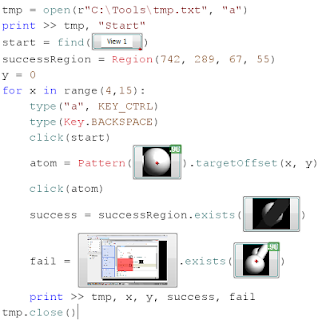 On every iteration of the loop it clears the Avogadro window, clicks to create a methane, and then clicks at point x, y on a particular hydrogen (where x, y are relative to the centre of the image of the matched hydrogen) trying to sprout a methyl. The "success test" checks that a methyl sprouted. The "fail test" checks whether a methane was added (i.e. the region to the right of the red bar in the diagram of the atom above). Note that fuzzy matching is used to match screenshots against the actual contents of the screen or a region.